There’s a patch of garden next to the back door that’s a little less kempt and where straggly clumps of grass reappear every spring. In our sporadic attempts to tidy it, we’ve pulled these weedy plants up by the handful, only to notice their bulbous endings and pungent odor. As it turns out, we’d stumbled upon wild garlic, Allium vineale. 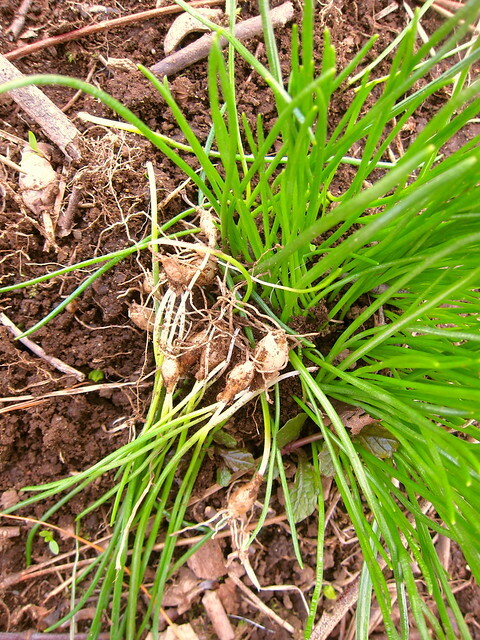 In addition to wild garlic, other common names for this herbaceous perennial are field garlic, crow garlic, or stag’s garlic. 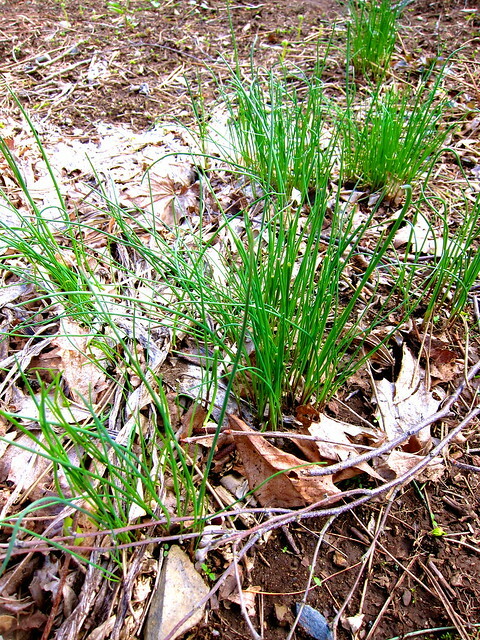 It’s easy to mistake it for the nearly identical wild onion, Allium canadense, save for a few differences — where wild garlic leaves are hollow and the bulb covered with a papery skin, instead, wild onion leaves are solid and the bulb has a netted sheath. Other than that, they’re virtually interchangeable in terms of culinary use, and all parts of both plants are edible. Note: Ramps (Allium tricoccum) and ramsons (Allium ursinum) are also commonly referred to as wild garlic or wild onion, and are identified by their broader leaves. Wild garlic thrives on the edges of forests and fields, and this particular patch (above) resides where the garden transitions to woodland. These forageable alliums are also common to lawns and other grassy areas, but may be obscured if the area is frequently mowed. They can be a particularly unwelcome presence in pastures where dairy cows are kept, as its ingestion can taint the milk and spoil it with an garlicky flavor. Unlike ramps, wild garlic is certainly in no danger of being over-foraged; do avoid foraging in roadside areas or other places that have been chemically treated. All parts of wild garlic and onion have a strong aroma, especially when broken or torn, and is a reassuring way of identifying it as edible. Be aware there are a few toxic look-alikes, such as the descriptively named death camas (Toxicoscordion venenosum). Avoid grass that has even ends, flat stalks, and, most importantly, a lack of onion or garlic smell; if there’s any doubt, it should not be eaten. We dug up a patch of similar-looking grassy vegetation to test this, and found the bulbs scentless when crushed (above), a distinct difference from the wild garlic near it. Like other edible alliums, the entire plant may be eaten either raw or cooked, and it’s appearance in early spring provides a multitude of vitamins and minerals. 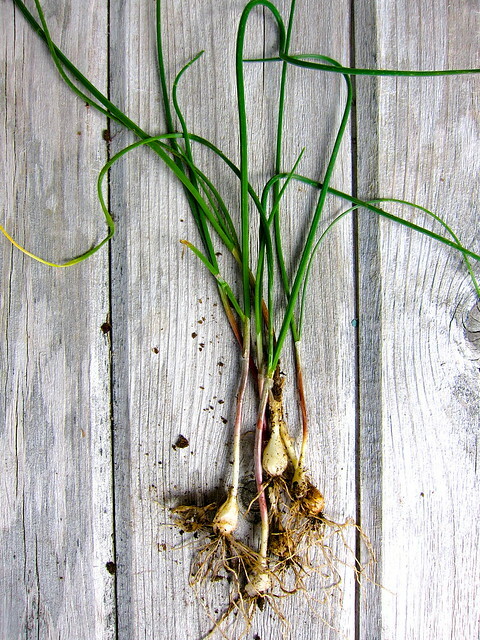 The versatile stalks may be snipped atop a salad and tossed with a lemony dressing, chopped into a tonic soup, blended into a vibrant pesto, fried into crispy pancakes, baked into a cheesy bread, fermented into a tangy kimchi, and the bulbs used for crunchy pickles or to infuse a tangy vinegar. As the season progresses, our attention will turn elsewhere; for now, however, this oft overlooked wild edible is having its moment in the garden. 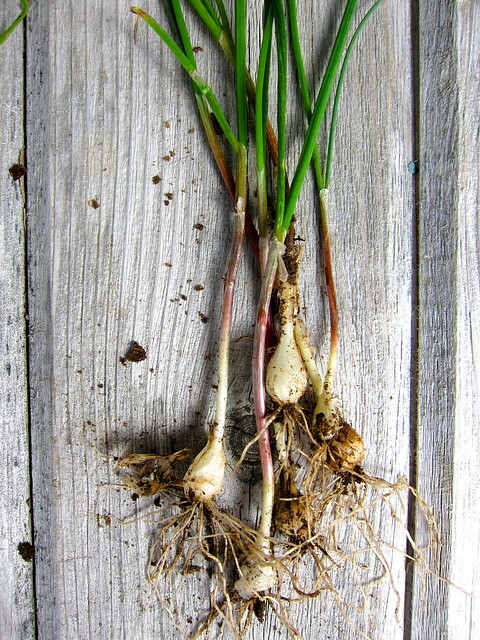 This entry was posted in garden and tagged alliums, foraging, garlic, wild garlic, wild onions. Bookmark the permalink. I see similar plants EVERYWHERE. Perhaps I’ll go a-digging later today & see what I come up with! Thanks so much for the awesome info!! You’re quite welcome! We were initially scared of misidentifying something toxic like death camas, but the smell of garlic and onions is an easy and simple way to tell them apart! I love foraging for food, when were in Oregon after the rains we look for chanterelles and they are amazing! What a surprise when I found some wild garlic at the Ringwood Gardens in Ringwood, NJ. My granddaughters (whoops) picked some and I ate a sample. Wow! Wonderful and flavorful. Not what I expected since I am a chive lover. Much better! Want to grow some myself here at Katharine’s Garden on Long Island, Maine! We are inundated with these guys! The whole neighborhood has them in lawns, in garden beds. I dug most of mine out, but a few remain. I knew they were edible, but I was just so frustrated with how many there were I saw them more as a nuisance. But your post is so lovely that I’ll give these guys a chance. 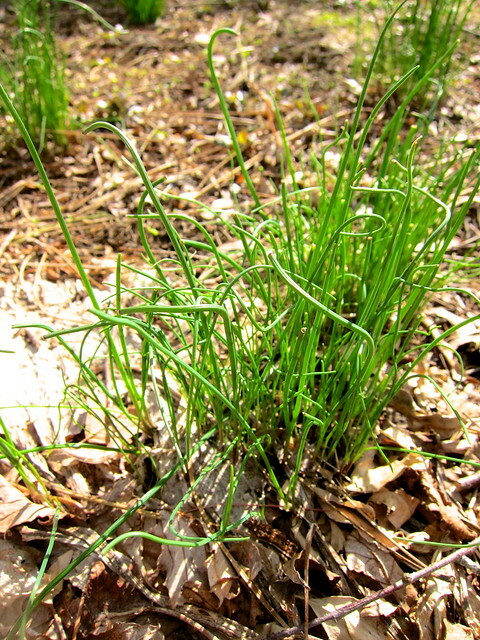 When I was a kid I used to pick wild onions from the woods. They were nodding onions. I would find the onions when they bloomed as it was easier to tell what they were then.